Working on Your Beaded Books? 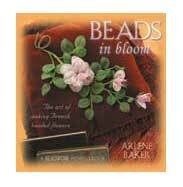 I pulled out Arlene Baker’s Beads in Bloom, a great book that outlines French-style beaded wire flower techniques. Arlene is a true expert on the subject—a real aficionado who collects and studies antique beaded flowers so she can make them in the true traditional style. I also happen to know that Arlene is a very meticulous and lovely person, and that’s why her instructions are so good! Even a time-challenged, impatient, lazy person like me can learn. You can buy this book and many others at 25% off during our Beader Appreciation Sale running through Novemeber 14th. 1. String 7" of size 11° beads on 28-gauge wire without cutting the wire from the spool. If you have a bead spinner this goes even faster. Make a tight loop at the wire end to keep the beads from sliding off. 2. Pull 3 beads toward the end and slide the rest of the beads toward the spool, giving yourself about 7" of bare wire in between. These are your core beads. 4. Slide 4 or 5 beads toward the core and keep the rest toward the spool; lay them alongside the core beads. Wrap the bare wire once around the wire neck above the core beads. 5. Slide 5 or 6 beads toward the wrap you just made. Lay them alongside the other side of the core beads. Wrap the bare wire once around the twist under the core beads. 6. Repeat step 4, increasing the number of beads so the wrap stays flat along the core. 8. Trim the top wire to 1/8" and tuck it flat against the back of the petal. Trim the bottom stem. I had fun playing around with my little “pages.” I can see adding many of them to the center post to make a book that produces random poems. We’ll see, we’ll see . . .
Have you started working on a book yet for the Beaded Book contest? Tell us about it on the website.